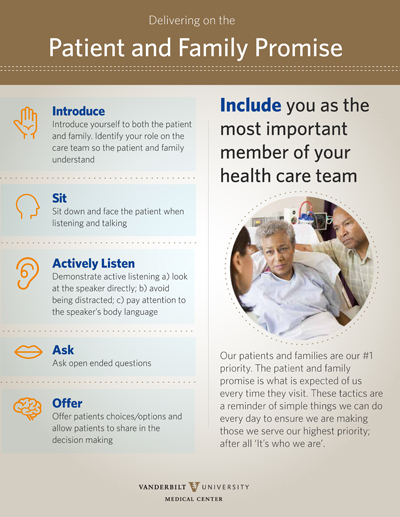 Beginning this week, the first of a series of six messages is being distributed to Vanderbilt University Medical Center (VUMC) employees highlighting ways to best fulfill the Vanderbilt Patient and Family Promise, a guiding principle that was created by patients and providers and adopted at VUMC in 2013. “Our patients and their families always come first, and the Patient and Family Promise represents what we aspire to achieve here every day,” said Paul Sternberg Jr., M.D., VUMC Chief Patient Experience and Service Officer. “With our upcoming eStar implementation, it is critical that we keep patients front of mind as we navigate the challenges we will face as we adapt to new scripts and workflows. • Include you as the most important member of your health care team. • Respect your right to privacy. • Work with you to coordinate your care. • Personalize your care with a focus on your values and needs. • Communicate clearly and regularly. • Serve you and your family with kindness and respect. The initial message focuses on the portion of the promise that states patients and their families are the most important members of their health care team. A one-page visual summary has been designed, complete with easy action steps or tactics employees can follow in their daily practice to keep this part of the promise. Carlson and Director of Patient and Family Engagement Terrell Smith worked with the Vanderbilt University Adult Hospital and Monroe Carell Jr. Children’s Hospital at Vanderbilt Patient and Family Advisory Councils, as well as with the AdviseVanderbilt online advisory group, to identify the best tactics to fulfill each of the six elements of the promise. “These messages will be distributed regularly in the coming weeks through MyVUMC,” Smith said.